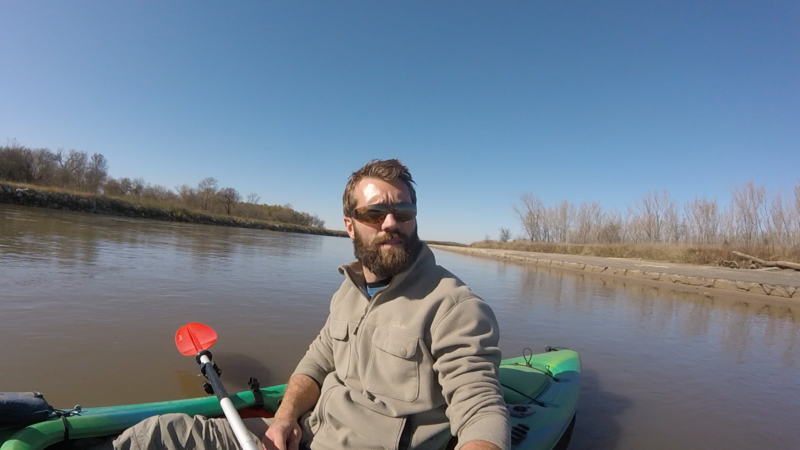 Saturday October 28, My brother and I began our 23 mile long kayak trip down the Elkhorn River. We launched our kayaks at the highway 91 access point at about 10:30am. The low temperature from the night before dropped to 17°F, so we had dressed with full base layers under everything else we were wearing that morning. As midday came, the temperature eventually reached 50°F and with the sun directly on us, it was a perfect day for kayaking. Shortly after 1pm we found a nice sand bar to stop on for lunch of MRE’s and mozzarella cheese sticks. We were back on the water by 2pm and had about 6 more miles on the water till we hit our planned camp location. Unfortunately only 1 1/2 hours later My brother hit a submerged log and tipped his kayak over, dumping him out and into the water. He was able to get above water and brace himself and his kayak against some more downed trees. 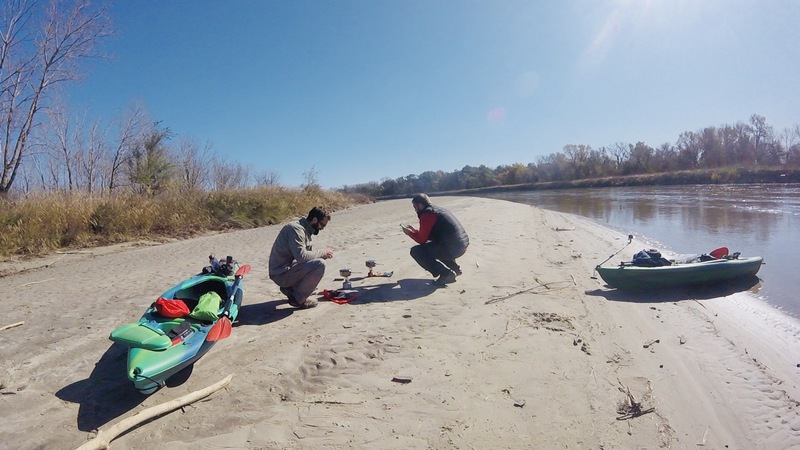 After getting his kayak drained as best we could in our current location, we decided to shoot across the river and onto a more accessible sand bar to better evaluate the plan. After a short rest we decided we would proceed with paddling down stream. 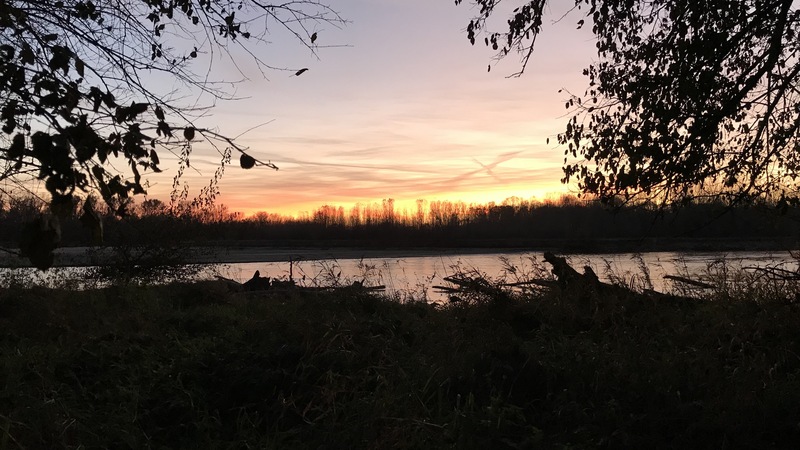 By 6pm and a total of 13 miles paddles, we had found a good location to pull off the water and set up camp. After the hammocks were hung and enough wood was gathered, we began to baton the wood down for making the fire. Ramen and bannock was for supper followed up with a clear star filled sky to sleep under. Sunday October 29th, A 35°F night made for a perfect sleep in the hammocks. 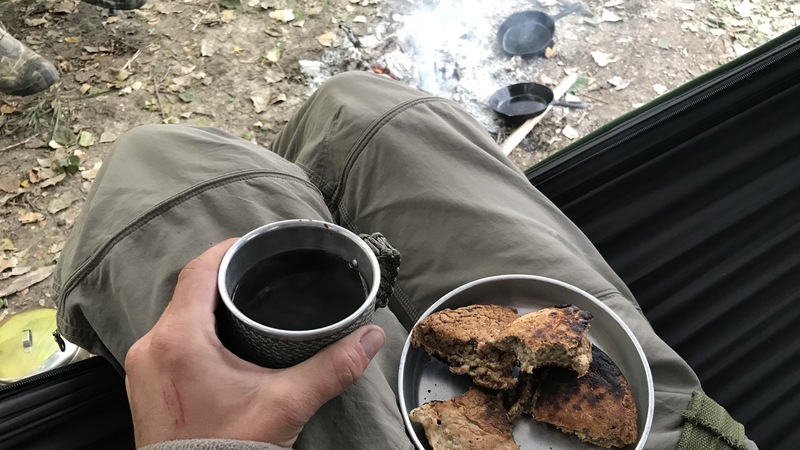 After waking to deer and turkey stomping through the leaves surrounding us, we walked down to the waters edge to get some river water to filter for breakfast and for the rest of our trip. After breakfast of bannock and coffee we slowly packed up camp and headed back out of the trees and to the river. Windy and chilly start to the morning on the water, and at times we would just about sit still in the water as the wind pushed us back. We had made it farther than expected the day before so after only 10 miles of paddling we had made it to Elkhorn Crossing by 2pm.